A few weeks ago I (along with other local Delaware artists: Kristen Margiotta, Greg Fischer and Sean Flynn) were asked to design tap handles for a collaborative beer between 1984 (a Wilmington, Delaware bar specializing in arcade games and craft beer) and Stewarts Brewing Company (a Bear, Delaware brewpub). 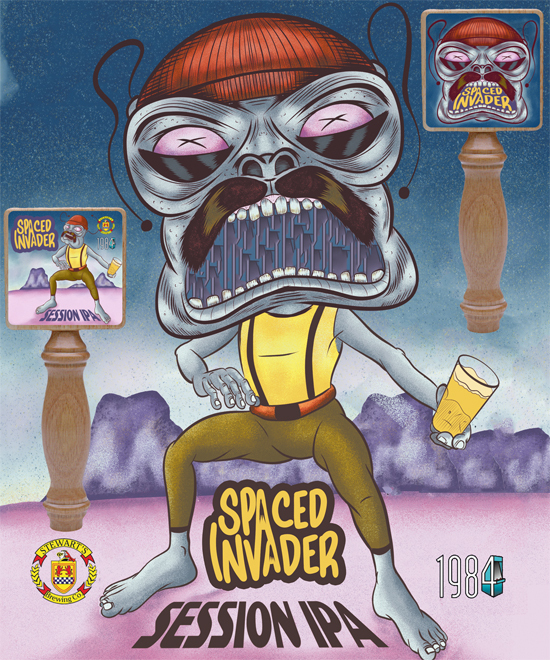 The beer is called Spaced Invader and it’s a session IPA that was released on Friday, November 7th, 2014 at 1984. The four custom tap handles will be switched out and rotated for the duration of the beer’s time at the bar. In addition to the tap handle that I designed, I put together a limited edition 8″x10″ print on 100lb True White speckletone French Paper that is available now in my store.